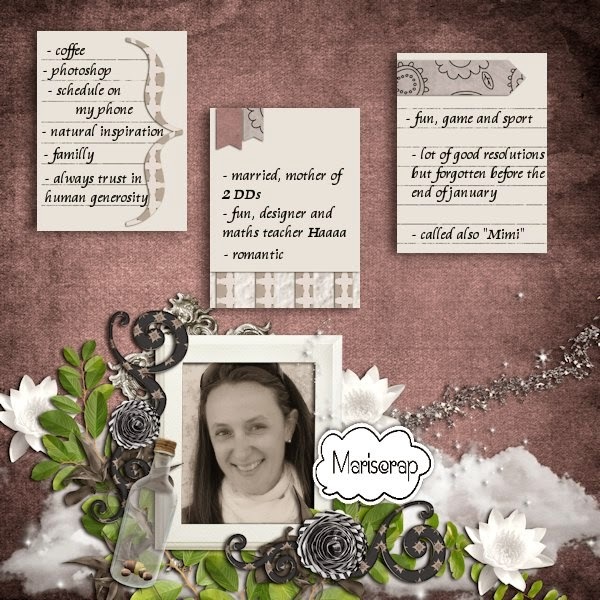 MyMemories Blog: Meet Today's Daily Designer....MariScrap! I'm Mariscrap, 37 years old....wouawww the time goes up so quickly!! fantastic, awesome digital scrap pages...and that's it!!! I thought that if some Ladies could do that, I could do too. I started to CT for some designers and after decided to designer myself. I create some digital product since 2009 now!!! At the moment, I have a CT call..so don't hesitate to apply (see the subject on the forum)..beginner are welcome too!!! I was a beginner one day too. during party and BBQ) i'm a maths teacher in real life...yes trust me!!! Have a nice day everyone, wish you the best for all your porjects and bless your familly. Enjoy 40% OFF Mariscrap's Design Shop at MyMemories until August 10!